The Red Warrior Society and Mothers Against Meth Alliance (MAMA), on their ongoing “Ride for Resistance” tour of the East Coast to promote and protect indigenous rights, stopped in Hartford on Monday, Feb. 7. 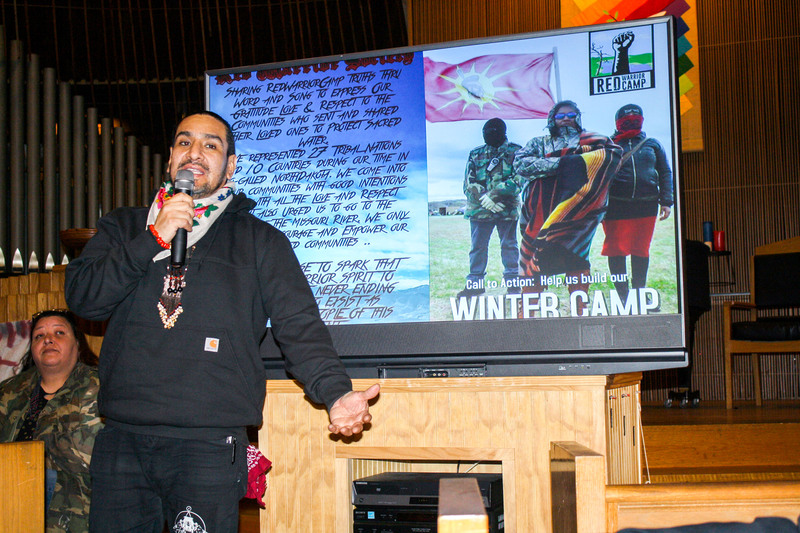 Hosted at the Unitarian Universalist Church, the event featured seasoned indigenous protesters who shared their experiences fighting for their rights to clean water and land. The Red Warrior Society and MAMA, working in conjunction, are heavily involved in protests against the Dakota Access Pipeline (DAPL). Over the course of the evening, the speakers gave their stories as well as called members of the audience, which included several University students, to action. MAMA founder Julie Richards opened the night with some backstory on how she became involved with the efforts to protect indigenous rights, and the origin of MAMA. Her story is a tumultuous one, beginning in her childhood and still unfolding now. Richards explained that her mother was a single parent of four. As a child, she was abused by her mother’s boyfriend, which led to emotional problems later in life. When she went to high school, Richards explained that she struggled with self-esteem issues and alcohol usage. “I began to drink, I started having ugly feelings about myself and I hated myself,” said Richards. “I started drinking and using drugs. I started having hateful feelings toward my mom. Richards explained that she became involved with an older man and became pregnant at 15. She went on to note that despite the responsibilities of single-parenthood, she still wanted to go back to school. With the help of her mother and brothers, she graduated high school, and then went to college. There, she met another older man, with whom she had another daughter. “I ended up getting married to him, and he turned out to be very abusive,” Richards said. “I was married to him for 17 years and the last time we met he almost killed me, so I ended up divorcing him after 17 years. After this period in her life, Richards said she again turned to alcohol. Despite these many leaps forward, Richards explained that things in her life were not entirely healed. This prompted the origin of MAMA, Richards’ meth awareness and resistance organization that has close ties to the Red Warrior Society. Meth usage, Richards notes, is a serious problem in indigenous communities, and it has been given little attention. Richards explained that her attempts to eradicate meth usage in her area stem from a distrust of the police and a deep desire for change. Richards does not fight solely against meth, however, and has been actively involved in Red Warrior Society for some time. Her work spans across multiple issues affecting indigenous people, from meth to water and land rights and protests against the Dakota Access Pipeline. She gives credit to her great grandmother for her will to fight. The next to speak was Victor Puertas, who too has been heavily involved in protests, including many against the Dakota Access Pipeline. Puertas described the Red Warrior Society, which is a nonviolent group of individuals dedicated to ending the construction of the Dakota Access Pipeline, which they claim will contaminate drinking water and disrupt indigenous lands. The pipeline’s construction, thought stalled, has recently been backed by the new Trump Administration. He went on to describe the detrimental effects of the construction of the pipeline. He noted that protesters remain persistently peaceful, while police will use freezing water, pepper spray, tear gas and even dogs to force them to leave protests and to deter their efforts. With videos of police spraying protestors with tear gas or water playing on the screen next to him, Puertas told the audience of his experiences protesting. The University’s Fossil Fuel Divest group, which is dedicated to protesting University investment in fossil fuels and thereby protecting people and the environment, provided vans for students to attend the event. Mina Klein ’17, an active member of the Fossil Fuel Divest, is among those who were in attendance. Despite the many obstacles protesters face, Puertas noted that he is thoroughly impressed with the level of bravery and dedication he has seen.